I’ve just received a really nice email from someone seeking information about a German military bridle. I’m hopelessly ignorant about military equipment, so I thought I’d throw the question open to those who are far more knowledgeable on the subject. “My name is Nick and I live in Oklahoma City, U.S. I have recently obtained a horse bridle with reins and decorative neckpiece for a horse that was originally obtained overseas during World War 2 when the German officer who had the tack on his horse was shot and killed. The American soldier who brought the bridle and neckpiece back passed it down to his son, who then sold it to me. I am looking for any information as to what type of German unit would have used this type of tack, what rank of officer might have had it, age, maker, etc. Any information that you could provide would be greatly helpful. The story is very intriguing and the bridle itself is even more intriguing. It appears to be a Napoleonic-style bridle as it makes an “X” across the horse’s forehead with a silver medallion in the middle of the forehead. 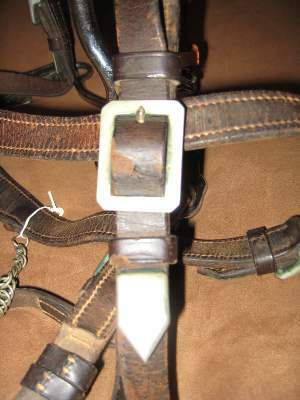 The browband is leather with chain-link overlay, and the noseband is leather with silver-toned conchos. All metal on the bridle is silver-toned. 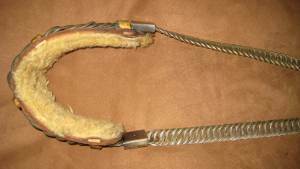 The neck piece consists of a thick leather band, approximately 8 inches long with sheepskin underlining and heavy chain link draped across the top and secured to the leather. 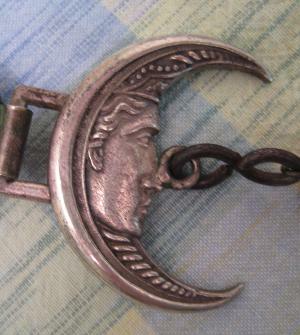 The chain itself is approx 2.5-3 feet long and comes together at a crescent-moon medallion that has a face on it. Hanging from the crescent moon is a horse-hair tassel that is dyed red, white, and black. I have been researching to find what type of tack the German/French/Polish cavalry used during WWI and WWII, but have not had much luck. Again, any information would be much appreciated. 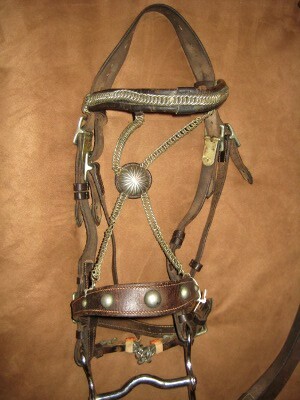 I have attached pictures of the bridle and neck piece to this e-mail. 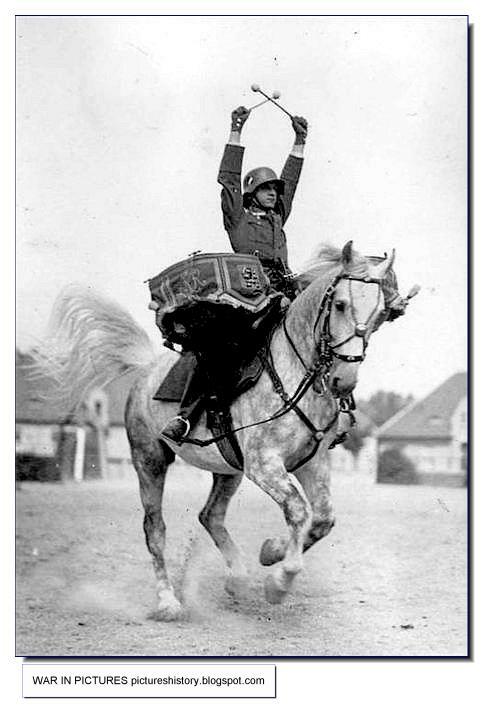 I have also attached pictures of a German SS drummer whose bridle is very similar and also has the crescent moon pendant with horse hair tassle hanging below the horse’s throat. I couldn’t identify the bridle, but please look at the images & see if it rings any bells. 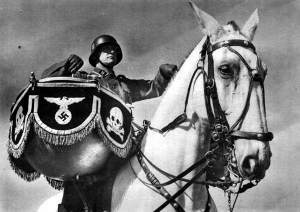 This entry was posted in Military horse, Uncategorized and tagged army, bridle, cavalry, drumhorse, German, plume. Bookmark the permalink. 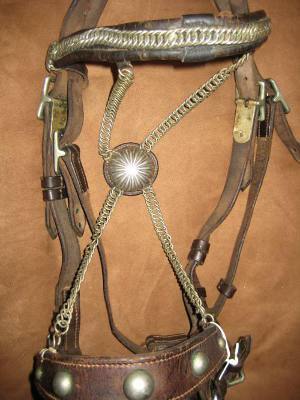 This is a beautiful bridle – it reminds me of the tack used by the Queen’s Cavalry and the Blues and Royals in England. I can’t tell you what kind of German regiment would have used tack like this, but from what I can see, the bit is not original to the bridle. 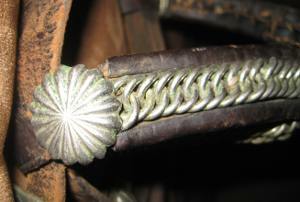 It appears to be a fairly typical bit that would have been used on an American Western-style bridle. Not a design that was commonly used in Europe, especially not on “official” cavalry equipment.